This post was not planned but indeed a special one as I was requested for the recipe of “Doodh Maach” by a reader. When the request is from somebody who took the pledge of reading my novice blog how can I ignore the request. 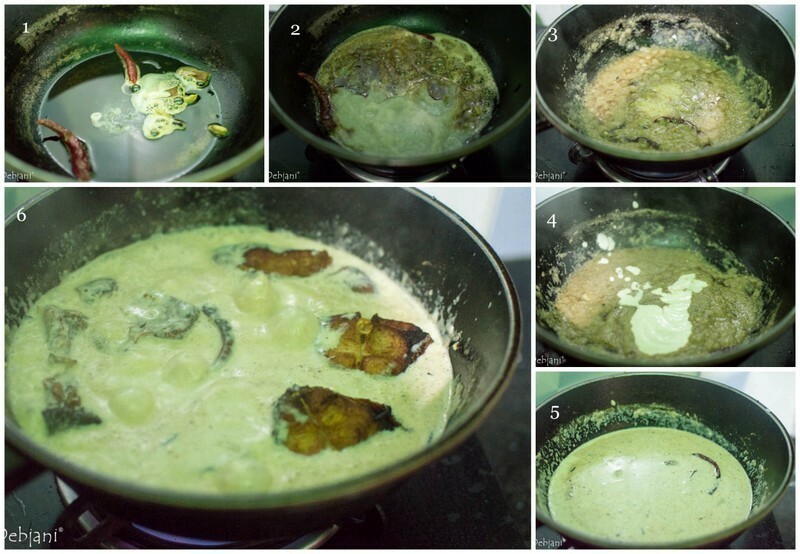 “Doodh Maach” or Fish cooked with milk is not something I cook quite often, in fact, I prefer to cook fish with yogurt, be it Doi Maach (with Rohu or Katla) or Doi Ilish. However, milk is something that can be used very easily (though tactfully to avoid curdling) while cooking fish given the richness of milk. I don’t have a set recipe for Doodh Maach and the recipe I am going to share is my improvisation. Given the heart of this particular fish, curry is Doodh or Milk I decided to stick to the color of the dish to creamy white and hence didn’t used Turmeric Powder, which we mostly use while cooking fish in Bengali way. Milk is itself rich so why not to add some more richness and hence little Cashew nut paste and ghee. To restrict the flavor light, instead of Onion paste, I have used boiled Onion Paste and little “Beresta” (Onion crisps) and little spices. I have used “Katla” to make Doodh Maach, however, Rohu, Bhetki, or any fish with big bone can also be used based on the availability. I have opted for thick gravy for the Doodh Maach. My homely guinea pigs (read Mehebub and Pasta) liked the Doodh Maach a lot and Pasta even requested for another serving of the gravy! I would love to hear from my readers, about their opinion. Green Chili Paste: 1 Tsp. Rub some salt to the fish chunks and leave for 10 minutes. Boil 2 Onion and make a smooth paste. Thinly chop rest of the onions. Make a paste of the Cashew nut after soaking those in water for 10 minutes. Now heat the Mustard oil in a pan until the oil changes the color and fry the chopped onion until those turn brown and crisp. Strain Fried Onion or Beresta from Oil. Lightly fry the fishes in remaining oil and strain from the oil. Now add Ghee to the leftover oil and heat sufficiently. Temper the Ghee-Oil mixture with Bay Leaf, Green Cardamom, Black Cardamom(whole), Dry Red Chili, and Cinnamon Stick. Add Boiled onion paste and cook till oil leaves the side. Add Ginger and Garlic Paste and Green Chili Paste and again cook for one more minute and slow down the flame. Now heat the milk for 1-2 minutes and add the milk to the friend spices followed by salt and sugar. Keep the flame on the lower side and mix thoroughly. Now add fried fish pieces and cook on low flame for 5-7 minutes or until the gravy thickens to desired consistency. Finish Doodh Maach with Slit Green Chilies and Fried onions and serve hot with steamed rice. 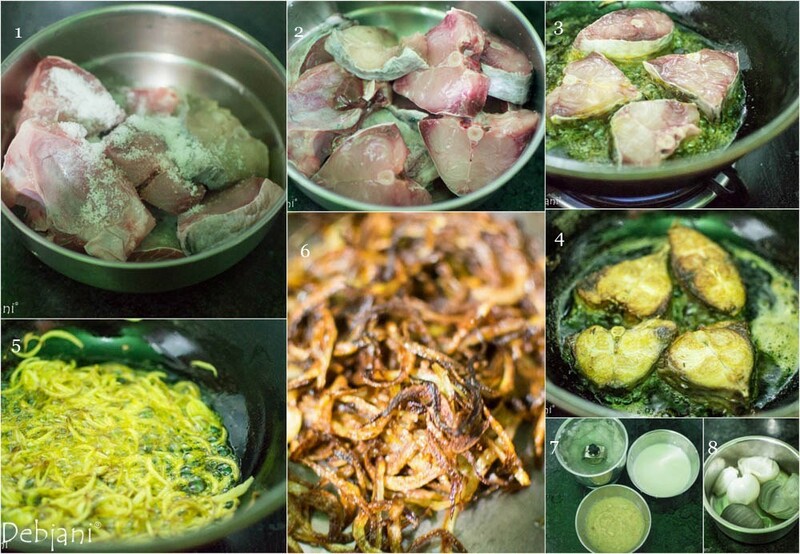 Instead of Katla Fish, Rohu, Bhetki or any fish with bone can be used. If having the nut allergy, replace Cashewnut with poppy seed paste. Gravy can be a runny one as well instead of the thick gravy I have made. If you liked the Doodh Maach or you wanted to try other Fish recipes, these can help you from my blog, Doi Maach, Malabar Fish Curry or Aloo Fulkopi diye Macher Jhol. Have you tried the Doodh Maach Recipe from Debjanir Rannaghar!